Top Kill Fails; What's Next? Changing the Politics of Offshore Drilling? How Far Can a Bird Fly Nonstop During Migration? An End in Sight to the Oil Leakage? According to BP, it succeeded in intubating the riser pipe from the leaking Deepwater Horizon well. The company says it is capturing about one fifth of the oil leaking though the pipe and hopes to raise that amount to three quarters. Meanwhile a significant amount of oil is still leaking into the gulf. It is not clear from reports exactly how many gallons are being captured and how many are still leaking. It is also not clear whether the proportions are the same whether the spill rate is closer to BP's estimate or that of independent experts. The next attempt to stop the spill will be a "top kill," which entails jamming mud and cement into the top of the well until the leak stops. That would be at best a temporary patch until a relief well is ready in August. This study implies that the greatest risk of land impacts by surface oil caught in the Loop Current is along the ocean side of the Florida Keys, and along the coast of Southeast Florida from Miami to West Palm Beach. Eddies breaking away from the Gulf Stream would also likely bring oil to northwest Cuba, the western Bahamas, and the U.S. East Coast as far north as Cape Hatteras, North Carolina, though at lesser concentrations. Southwest Florida cannot rest entirely, though--the "forbidden zone" is only true for surface waters, and there is onshore flow below the surface. 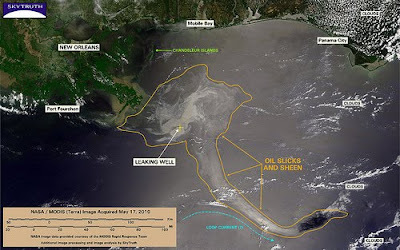 Since recent ship measurements have detected substantial plumes of oil beneath the surface, southwest Florida might be at risk if one of these plumes gets entrained into the Loop Current. ... There are plans for the Hurricane Hunters to go out again tomorrow and drop more probes into the spill to attempt to get a better handle on where the oil is and where the currents are taking it. It is possible that some of that oil has already arrived, and a major barrier reef could be at risk. The risk to the reef is magnified if you consider that there is far more oil present underwater than is visible on the surface. BP has used massive amounts of dispersants to break up the oil leaking from the riser pipe. As a result, most of the oil is not reaching the surface. What this means is that underwater ecosystems are probably at far greater risk than bird nesting colonies, in either Louisiana or the Florida Keys.